This week we talked about Big Sean and his cemented place in the discussion of the contemporary rap game. 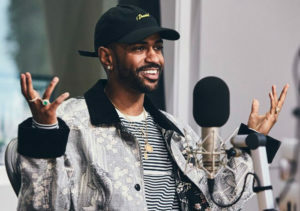 Sean Don’s latest albums have done the numbers and have brought in a serious rap following for the Detroit artist. We discussed which of Sean’s albums/ tape were the best and came to the consensus that “Dark Sky Paradise” was our favourite. From beginning to end, Sean delivered hits that sparked the conversation as to whether he is top 5 today. Dj Bhav the Sav and Dj Brotha Ace did not think the Detroit rapper was worthy of that status because of way more relevant artists in the game today. Big Sean has been putting it out there in the past year that not only is he in the top 5, he’s coming or the number 1 spot. We look forward to more music from Sean and hope he can prove himself better than his other contemporary artists, like Kendrick Lamar. Kanye West surprised fans at Kid Cudi’s Chicago show by coming out to perform “Father Stretch My Hands Pt. I”. This is the first time he’s performed since the cancellation of his tour last year, due to having to admit himself to the hospital. He really brought out the energy as you can tell from this video down below, and it’s great to see him healthy and smiling. Big K.R.I.T is one of those rappers in the game that comes with the lyrics comes with the hooks but for some reason was never able to become commercially successful. 4Eva is A Real Long Time his 3rd studio album was for the most part a success. It received amazing reviews from music insiders and critics and for good reason. The first half of the album is very classic Big K.R.I.T rough but lyrical the second half of the album is more experimental where we hear him mixing his rough voice with gospel/country sounding tunes and jazzy hooks. On the first half of the album we would recommend the songs “Big Bank”, “Subenstein” and “1999” off the second half we would recommend the songs “Miss Georgia”, “Drinking Sessions” and “Bury me in gold”. Despite having more than 20 songs this album stayed focused and provided tunes that will most definitely be on repeat for weeks to come. In all this album deserves a solid 7.5/10. Unfortunately, we could not get the music working this week. So we are going to come back next Monday even stronger with bangers for days…so tune in next time!